Blend TERZI No. 1: 100% Arabica of current crops. Our first Blend, elegant, complex, versatile, extremely modern according to the latest trends in the Coffee world. Suitable for pure consumption, suitable for “alternative methods” such as Pour Over, Turkish Coffee or Syphon, as well as for a delicate Cappuccino with a great respect for Milk, which must be of good quality. Very high commercial yield, though quite critical in the transformation, and a little hard to work. It was tested at the International Coffee Tasting in 2008 and received the gold medal. Low caffeine content. Blend TERZI No. 2: 100% Arabica of current crops. Produced only on demand for minimum quantities of 80 kg. Blend TERZI No. 3: Assembling Arabica and Robusta of current crops. Designed and developped for the best combination with Milk. Pure is an intense, balanced, harmonious and fragrant Espresso, with excellent balance of acids/tannins, a little bit skewed in favour of the second ones. Combined with Milk, it expands, breathes, widens, becoming more aromatic and elegant. Great Blend of great commercial yield, for bars that serve many breakfasts and want a Cappuccino with the capital C! Medium caffeine content. Blend TERZI No. 4: Assembling Arabica and Robusta of current crops. Typical italian Espresso, intense, fragrant, not very acid and with upper-middle caffeine content. Very versatile to be served as typical italian Espresso or with Milk for an excellent Cappuccino. It is produced only on demand for minimum quantities of 80 kg. 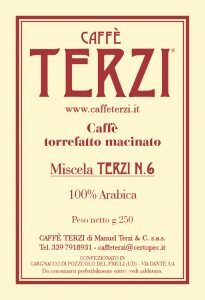 Blend TERZI No. 5: 100% Robusta with current crops. A classic Old Fashioned Espresso. A cup of Neapolitan style for those who prefer extreme tasting intensity instead of “length” and retronasal feelings after swallowing. Intense, no acid, full-bodied, syrupy, and chocolaty. The ideal Espresso to start the day with energy. High commercial yield and high versatility compared to extraction parameters (grammage, time and temperature). Try it the “Turkish way”, in Ibrik, and you will feel like you are in Istanbul! Blend suitable for the combination with Milk. High caffeine content. Blend TERZI No. 6: 100% of current crops. A best buy! Our most appreciated and best-selling Blend. Designed and made to provide the public with a perfect, clean, non-extreme product, but extremely current and with a satisfactory quality-price index. Designed and made to bring Customers closer to “100% Arabica” at a time when this was still considered a limit. Splendid Blend, well-balanced, harmonious but complex, not acrid but aromatic, gorgeous in purity but also great in combination with Milk, easy to work, and with high commercial yield. Low caffeine content. Blend TERZI Bio, 100% Arabica Lavati of current crops. Biologically certified Blend, it uses 100% Bio-certified grains. A Blend of strong personality and good commercial yield, it uses Bio certified grains, whose collection is not always easy. As for our Origins, it suffers from seasonality and, perhaps sometimes, its taste-olfactory profile in cup changes. Low caffeine content. Single Origins: We choose with total freedom, from year to year, only the best current crop Origins. With no purchase obligation with any supplier, our Origins may vary – and in fact it happens – from year to year, both for country and plantation of origin, and for botanical variety. Therefore, it is not easy to draw up a list or a detailed description: apart from the most “simple” as India Parchment, India Plantation, Congo N2, more readily findable, and always available, all the others – and we have plenty – vary almost continuously. Caffè Terzi is a micro reality of excellence, characterized by the modus operandi of a small artisan shop. This is the approach that allows it – and which has allowed it during all these years of experience – to meet specific needs and demands, till the point to be able to produce exclusive customized Blends (for minimum agreed volumes).